Legendary response given by PokerStars player "dnaperf" when player "spoonce" commented on the weird dog in his/her avatar. Now often used on internet poker message boards when someone posts a picture of an odd looking animal. 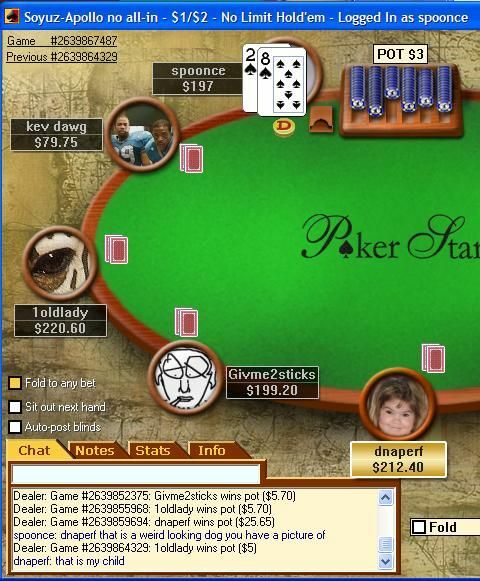 Years after the screenshot, Poker Terms caught up with spoonce and asked a few questions about the chat and screenshot. Poker Terms: Were you asking the question strictly for comedic value or to tilt the other player? spoonce: I said it to the guy both to tilt him and because I thought it was a little funny. But his reply was what made it hysterical to me, so I took a screenshot and put it up online. Poker Terms: Was there any conversation after the chat shown in the screen capture? spoonce: Unfortunately there was no conversation after that. There was no way I could say something that would top that, but from what I remember 3 or 4 of the people at the table actually laughed in the chat after his response. In the year after that I tried to prompt that response probably ten or twenty times, but it never happened again so I stopped. 1) Do not use a picture of your child as your avatar at an online poker room. 2) If someone makes an unkind comment about your child, do not respond. Just let it go. That is, unless you want to be made fun of for the rest of your online poker life. dnaperf's child is a tad ewok-ish.